I have an outdoors blog with google ads that verifies this trend. ...I read you article, I read PubMatics report, neither define " CPM ". I just gotta know; what's a CPM ? If a cpm were $1, you'd pay a publisher 1 for 1,000 ad impressions. Mind you these are for banner ads, which pay the least; text-based ads linked to search engine returns pay much better. 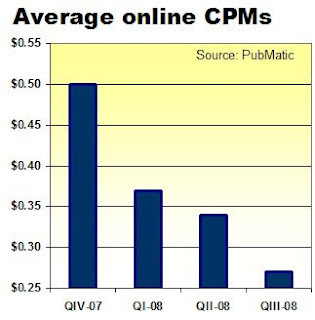 CPM = "cost per thousand" - it's a term more from TV/ radio/ online than from print media. It's the cost of reaching a fixed number of viewers of the advertising. More interesting are the reasons for the crash - it's tempting to simply blame lack of advertiser demand in an economic downturn, but I think that's only one piece of the equation. As more and more users come online with high speed internet, they "consume" more and more pageviews. Supply of pageviews is exploding (see Facebook and MySpace's stats as an example). This trend is only accelerating, especially as advertiser tools from both Google (Doubleclick) and Yahoo! (AMT) make it trivial for anyone to slap display ads on their site. Low CPMs (at least for non-niche topics) are here to stay, even when the economy eventually comes back. Move to CPA (cost per action) now if you haven't already. I don't disagree that there's broad and deep downward pressure on display advertising rates, but the index--which, frankly, appears rather noisy for market segments--appears to paint a more varied picture. Rates at news sites are unchanged from Q1 to Q3(though Q2 rates were 55 percent higher, and there appear not to be any data for Q4 07). And rates at medium sites that receive between one and 100 million page views monthly were all over the place but ultimately down 20 percent (This may be because Pubmatic's data is limited in these areas, and hence prone to greater sampling error, though I have no idea). Moreover, because the index is weighted heavily towards 'large' sites, which receive 100 million pageviews or more a month, the steep decline reflects ad rates there more than anything else. Yes things are bad, but if the report is accurate, some areas have weathered the decline a bit better.